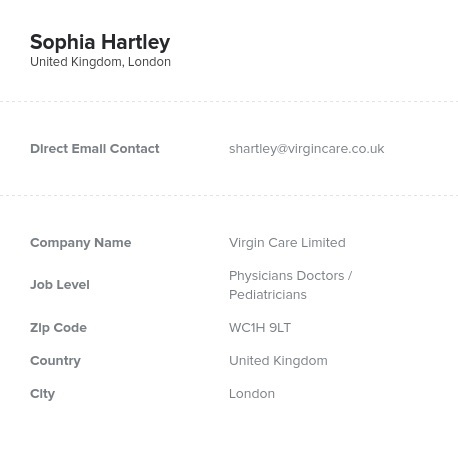 Look up UK-based doctors’ emails, phone numbers, fax numbers, addresses, and more with the help of this premium, human-verified directory from Bookyourdata.com. This doctor mailing list is full of accurate contact information that can help you make more connections in the UK. Conduct your medical or pharmaceutical marketing campaign more effectively with this lead list, which is full of the accurate contact information you need to make a connection. If you want to show a vast, spread-out group of highly qualified physicians your company's medical products, supplies, pharmaceuticals, or services, why not get a better and more reliable list of physicians from one of the top names in data? Bookyourdata.com aims to bring you together with the people who are most interested in your products. In this case, we offer a directory of doctors in the UK who you can market to right away, without paying extra fees. Start connecting with doctors in Great Britain and Northern Ireland within minutes of purchasing this list. Download it, integrate it into your sales program or CRM, and find all of the information you need in a few easy steps. This is one of our pre-built, ready-made directories. It's full of doctors' emails and contact information and ready to download straightaway. This list is specific to doctors within the UK; it's location-based so that you can connect with doctors with country-specific laws and regulations in mind. Pull this lead list and start emailing, writing to, and calling doctors in the UK now.